The hotels in Mexico’s Pacific Treasure actively participate in the Breast Cancer Awareness campaign with sporting events, gastronomy and special promotions. October is Breast Cancer Awareness Month—celebrated around the world thanks to the initiative of the World Health Organization (WHO)—is focused on increasing recognition and support for early detection, treatment and palliative care for this disease. During this time period, the Riviera Nayarit and its hotels are on board with the “Pink October” campaign, contributing on their end to raise awareness among visitors and even among residents and locals through events that serve to educate, raise funds and support breast cancer research. Sporting activities, gastronomy, health and wellness, and special promotions are all a part of the events that will take place in the destination over the course of the month; this movement grows each year, touching minds and hearts to get inspired and take action. Here are some of the properties that will be participating in Pink October. At the Four Seasons Resort Punta Mita the female talent will be wearing pink in support of the fight against breast cancer on October 21. The female culinary team made up by Sofía Mojica, Sandra Herrera, Esther Sánchez and Selene García will treat guests and invitees to an incredible four-course meal at Ketsi restaurant. Each one will create a special dish for the evening. The menu, inspired by superfoods and the region’s healthy ingredients will remind attendees that clean eating can be healthy and flavorful. All funds will be donated to the Breast Cancer Foundation (FUCAM by its acronym in Spanish). 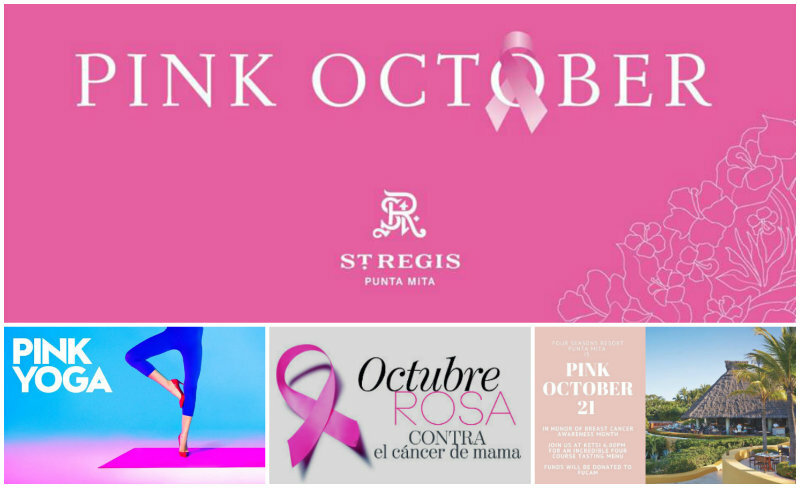 The St. Regis Punta Mita Resorts extends an invitation to another edition of the 5K Pink Run for the Cause, which will take place on October 28th on Punta Mita’s jogging path. Participants are encouraged to honor family and friends who are breast cancer survivors or currently fighting the disease by running with personalized signs. All funds will be donated to this noble cause. The top three winners will receive exquisite prizes: 1st place will get dinner for two at Carolina restaurant, winner of the AAA Five Diamond award; 2nd place will enjoy an exclusive session of flotation therapy; and 3rd place will enjoy a Marine Safari for two by Punta Mita Expeditions. Meeting place: Altamira Lobby at 8 a.m. According to the World Health Organization (WHO) breast cancer is the leading cause of cancer deaths among women and is responsible 11% of deaths caused by cancer. Breast cancer is diagnosed every 30 seconds somewhere around the world; also, one out of every eight women have or will have this cancer during their lifetime. In Mexico, the Secretary of Health reports 6 thousand deaths caused by breast cancer each year, and some 23 thousand new cases, which translates into 60 per day.